Who doesn’t drool a little over a juicy, fresh-off-the-vine strawberry? Well, maybe I can think of at least one person who doesn’t… but for the rest of us, it’s a magical experience for the taste buds. Turns out, us modern-day gardeners could step up our game in terms of strawberry appreciation. In the late 1300’s and throughout the 1400’s, strawberries were frequently appeared in the ornate illuminated manuscripts that came out of Western Europe. 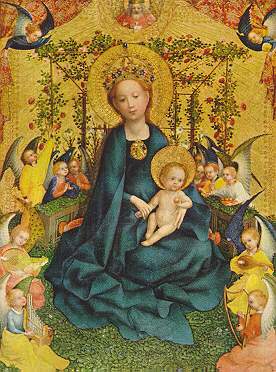 Monks and Mystics alike adorned their visions of the Virgin Mary and Infant Jesus with strawberry vines, flowers, and fruit blossoms. These red berries were the symbol of perfect righteousness. Layman’s terms? Wild woodland strawberries had halos. I kid you not. It seems Smuckers has relegated the delectable fruit back down from angelic to the human level of being, and there’s a perfectly good evolutionary explanation for why. The first documentation of the wild strawberry (Fragaria vesca) comes to us in the early 1300’s, when English foragers transplanted strawberries found in the woods to their home gardens. Small and infrequent berries kept this species from spreading far within the national cuisine, though the beauty of their voluminous flowers was well-revered. In 1624, expeditions to North America brought back a new species, Fragaria virginiana, which was cultivated by gardeners for King Louis XIII of France, among others. But it wasn’t until 1714, when a French spy brought the Fragaria chiloensis variety to France from Chile, that the strawberry really took off in popularity with breeders and eaters alike. The globular, dark fruit of the Fragaria chiloensis plants were more desirable than that of the Fragaria virginiana. However, due to the climate of its origin, the Chilean berry needed to be grown near warmer, coastal regions. This was certainly not as easy to find in Europe as in South America. The Fragaria virginiana was a much hardier variety, despite its meager fruits. So, breeders did as breeders do: created a superior strawberry. The first American cultivar was bred by Charles Hovey in Massachusetts. 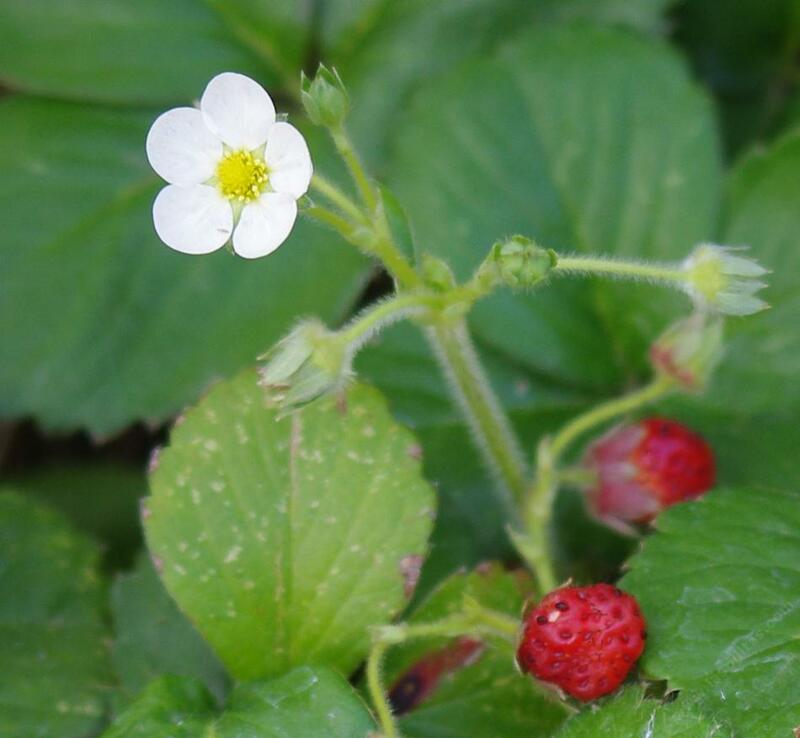 The Hovey strawberry selected for hardiness and large amounts of flowers so the plants would be self-reliant when it came to pollination. It’s hard to argue with the efficient polyamory of the plant world. Picking up some strawberries at the supermarket today? Chances are, that breed stems from the work of Harold Thomas and Earl Goldsmith in 1929 out in California. They developed a large, firm berry that could be picked while still ¼ green and successfully shipped to the east coast. If you were wondering, carbon footprints were not taken into account. Moral of the story? The strawberry has a complicated past, originally loved for its flowers and now bred meticulously for its fruits (which interestingly enough are not exactly fruits in the botanical sense). The red, fleshy part of the strawberry is actually the aggregate receptacle fruit. Scene: A couple is in the kitchen getting ready for work. Sonya: What are you having for breakfast this morning, honey? Alex: Oh, just some aggregate receptacle fruits. You? So, what we call the “seeds” of a strawberry are not the seeds, but the plant’s ovaries. The ovaries are the part of most fruiting plants that we actually eat. Within these tiny “seeds” of a strawberry, called achene, are even tinier seeds that are actually seeds. Now is the time, if you haven’t already, to get your strawberries into the ground. If it’s your first year, you’ll reap a small harvest, but keep in mind that your effort in is establishing your plants for future years. Strawberries are perennial runners, so be sure to plant them in a bed all to themselves, giving them ample space to expand. Generally, you should space strawberry plants one foot apart within a row, leaving two feet between rows. If you can avoid it, don’t plant them in a place where you’ve raised tomatoes, eggplants, or peppers in the past three years. They won’t like it very much. Don’t have any land? Try out some strawberries in containers. Make sure you have at least six inches on either side of the plant, mix some compost into the soil, and voilà! Strawberries at your beck and call. Why do we get to taste sweet, tangy strawberries so early in the season and have to wait so long for other fruits? Simple: long days and warm temperatures encourage leaf and runner growth. Short days and cool temperatures encourage flower formation. Be mindful. Strawberries are one of the most sensitive plants to small changes in their environment. Though you may be tempted to bed your strawberries in straw, if you were to ask an etymologist, they’d say don’t bother. Because strawberries first grew wild in the woods, it is thought that their name more likely came either from the straw-like appearance of the “seeds” (REMEMBER HOW THEY AREN’T SEEDS?) or else the straw-like extensions of the plant’s runners. At the end of the day, as long as they end up in my mouth, I’m content with their charming mystery.